The trailer of the Tank Transporter Sd.Ah.116 was suspended between two bogies, the rear of which was equipped with a separate steering mechanism. This model offers a great insight into the construction and operation of German's giant beast-of-burden. Stretching over 640mm, Tamiya's new beast-of-burden is 50mm longer than the Dragon Wagon and is the longest kit in the MM series. 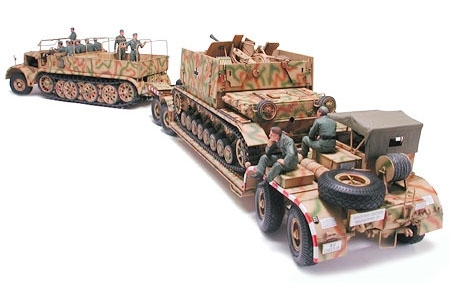 This kit brings back the eight figures of four poses included in the original "FAMO" kit, plus four all new figures of three poses acting out a tank loading scene at the rear of the trailer.